The idea of making walls by stacking bags of sand or earth has been around for at least a century. Originally sand bags were used for flood control and military bunkers because they are easy to transport to where they need to be used, fast to assemble, inexpensive, and effective at their task of warding off both water and bullets. At first natural materials such as burlap were used to manufacture the bags; more recently woven polypropylene has become the preferred material because of its superior strength. The burlap will actually last a bit longer if subjected to sunlight, but it will eventually rot if left damp, whereas polypropylene is unaffected by moisture. 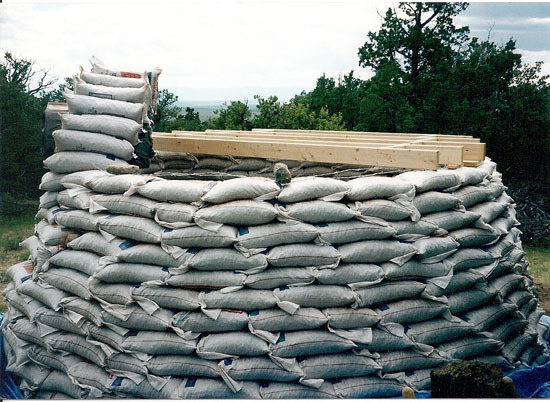 Because of this history of military and flood control, the use of sandbags has generally been associated with the construction of temporary structures or barriers. Using sandbags to actually build houses or permanent structures has been a relatively recent innovation. In 1976 Gernot Minke at the Research Laboratory for Experimental Building at Kassel Polytechnic College in Germany began to investigate the question of how natural building materials like sand and gravel could be used for building houses without the necessity of using binders. The use of fabric-packed bulk material was found to be a cost-efficient approach. They used pumice to pack in the bags, because it weighs less and has better thermal insulating properties than ordinary sand and gravel. Their first successful experiments were with corbelled dome shapes ( an inverted catenary) which was obtained with the aid of a rotating vertical template mounted at the center of the structure. It was an Iranian-born architect named Nader Khalili who has popularized the notion of building permanent structures with bags filled with earthen materials. Actually his first concept was to fill the bags with moon dust! 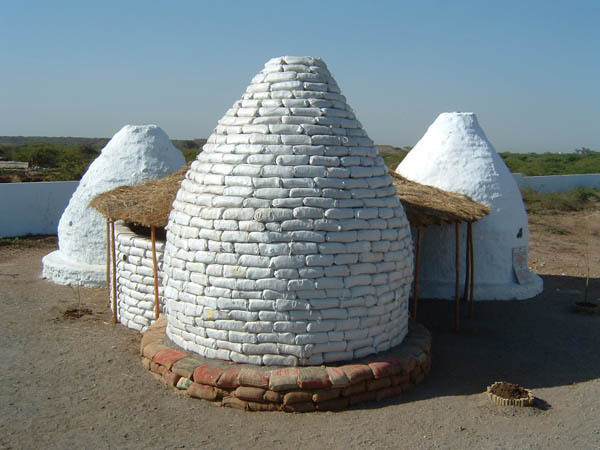 Attending a 1984 NASA symposium for brainstorming ways to build shelters on the moon, Khalili coupled the old sandbag idea with the ancient adobe dome and arch construction methods from his homeland in the Middle East . He realized that bags filled with lunar "dirt" could be stacked into domes or vaults to provide shelter. Khalili came up with a further refinement on this building concept on Earth: for a more permanent, shock-resistant structure, why not place strands of barbed wire between the courses of bags, thus unifying the shell into a more monolithic structure? At first Khalili was filling his experimental bags with desert sand, but then he evolved his idea of "superadobe," where bags or long tubes of polypropylene bag material would be filled with a moistened adobe soil that would dry into large adobe blocks. In this case the original bag material was merely the initial form and would not necessarily be an integral part of the eventual structure. Soon after these first experiments, Khalili began publicizing his work through newspaper and magazine articles and conducting workshops and seminars on the techniques that he was perfecting. Many people who read about his work, visited his compound in Hesperia , California , or studied with him there, decided to go ahead with their own experiments with his ideas. Among these "early adopters" were Joe Kennedy, Paulina Wojziekowska, Kaki Hunter and Doni Kiffmeyer, Akio Inoue, and Kelly Hart. I believe that it was Joe Kennedy who coined the more general term "earthbag" to suggest that the bag could contain a variety of earthen materials. Paulina Wojciechowska was the first to write an entire book on the topic of earthbag building: Building with Earth: A Guide to Flexible-Form Earthbag Construction was published in 2001. This featured some of her early experiments done at Khalili's CalEarth, along with several other case histories. Akio Inoue, from Tenri University in Japan, has done extensive experimentation with earthbag construction, both on the campus of the University and in India and Africa where many other domes have been built for assistance programs. Kaki Hunter and Doni Kiffmeyer (a couple) became enamored with earthbag construction after studying with Khalili, and worked on a variety of projects, both for themselves and for clients. In 2004 they wrote and got published another book, Earthbag Building : the Tools, Tricks and Techniques , based on their particular experience. 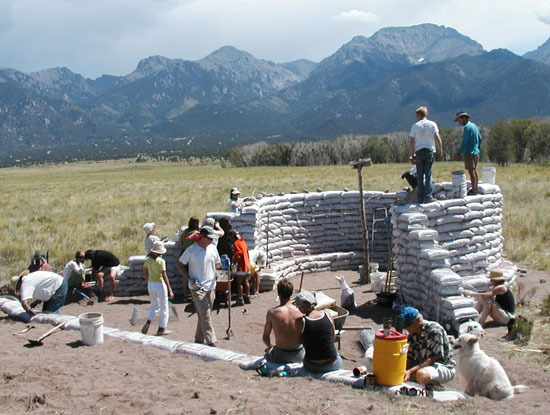 Kelly Hart (the author of this article) first began experimenting with earthbag building in 1997, after being exposed to the concept while producing his video program, A Sampler of Alternative Homes: Approaching Sustainable Architecture . He later documented his experience in actually building his own home in another program titled Building with Bags: How We Made Our Experimental Earthbag/Papercrete Home . Both of these programs are now available as DVD's. In the meantime, Nader Khalili was continuing the promotion of his "Superadobe" technique and eventually decided to patent the idea, which he obtained in the U. S. in 1999, using very general terms that cover using bags made of any material being filled with virtually any material, and combining these with barbed wired between the courses. While having made many public statements that this concept was his gift to humanity, he obviously wanted to capitalize on the potential economic reward. Many of us who had been engaged in promoting earthbag building on our own were contacted by Khalili and asked to enter into contracts with him in order to continue our work. It didn't take much research to discover that his patent could easily be disqualified because he had been publicizing his techniques through various media for at least four years before he even applied for his patent. Patent law clearly states that such publicity occurring prior to one year before the patent application would disqualify it for consideration. So now the door is wide open for anyone to take this concept and run with it, and more people are doing so all the time, all over the world. While Khalili (and most of his students) have focused primarily on using the bags to form large adobe blocks, others have tried filling the bags with a variety of other materials, such as crushed volcanic rock, crushed coral, non-adobe soils, gravel, and rice hulls. 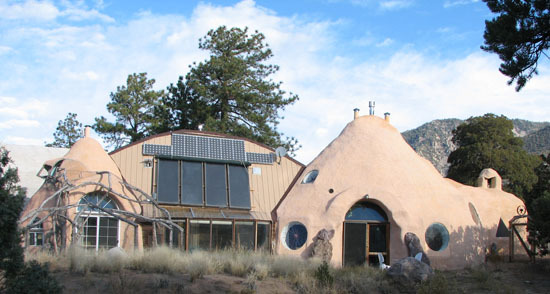 Earthbag building is unique among all other building technologies in that it can be either insulation or thermal mass, depending on what the bags are filled with. This is a very important distinction, because these characteristics of a wall greatly influence how comfortable, economical, and ecological any given system will be. Safety is of prime concern with all building technologies, and much experimentation and testing has been done to establish guidelines for many ways of building. Khalili has established a relationship with the building department in Hesperia , California where CalEarth is located, an area where earthquakes are naturally a great danger. In 1993 live-load tests to simulate seismic, snow and wind loads were performed on a number of domed earthbag structures at CalEarth and these exceeded code requirements by 200%. In 1995 dynamic and static load tests were performed on several prototypes for a planned Hesperia Museum and Nature Center to be constructed using Khalili's Superadobe concepts with both dome and vault shapes. All of these tests exceeded ICBO and City of Hesperia requirements. 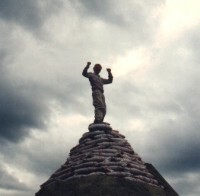 In 2006, at the request of Dr. Owen Geiger of the Geiger Research Institute of Sustainable Building, the Department of Civil and Mechanical Engineering of the U.S. Military Academy at West Point conducted several controlled and computer-monitored tests to determine the ability of polypropylene earthbags filled with sand, local soil, and rubble to withstand vertical loads. Their written report concluded that "overall, the earthbags show promise as a low cost building alternative. Very cheap, and easy to construct, they have proven durable under loads that will be seen in a single story residential home. More testing should prove the reliability and usefulness of earthbags." Despite the success of these tests, earthbag building concepts have yet to be incorporated into the International Residential Building Code. Obviously more enlightened acceptance of the demonstrated viability of earthbag building needs to occur! It is difficult to know how many residences and other earthbag structures have been made at this point, probably hundreds if not thousands. Many of us have been promoting the technique for use as emergency shelters, and certainly some have been built for this reason. It is easy for folks to accept this way of building temporary shelters because it fits the historical model of sandbag use. 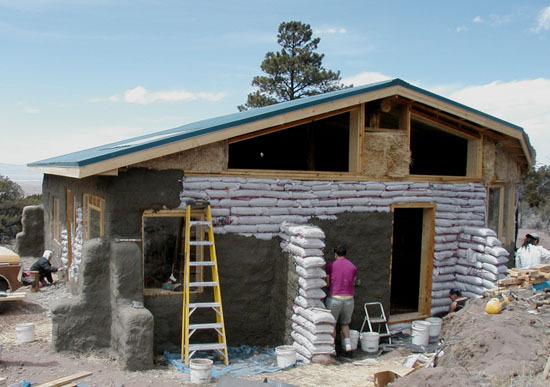 But many of us have also built substantial homes using earthbags, and in the process realized how truly versatile and sustainable the technique is. I wouldn't be surprised if many of these earthbag homes are still standing long after their conventional counterparts built contemporaneously have disintegrated.